This postcard is labeled "Hunt (NY) Sunday School group at Letchworth Park" and was published before 1915. 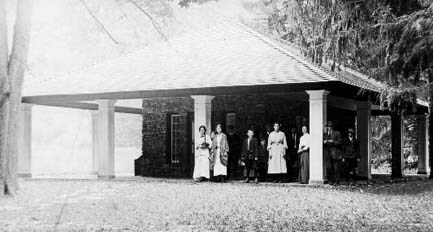 The group has decided to pose for their photograph in front of a brand new building near the Middle Falls - what is now called a "comfort station". This public bathroom was built in 1913 and has the distinction of being one of the first in the New York State Park System. It reflects the change that took place as the Glen Iris Estate evolved into Letchworth State Park. The same Comfort Station stands near the Middle Falls today!